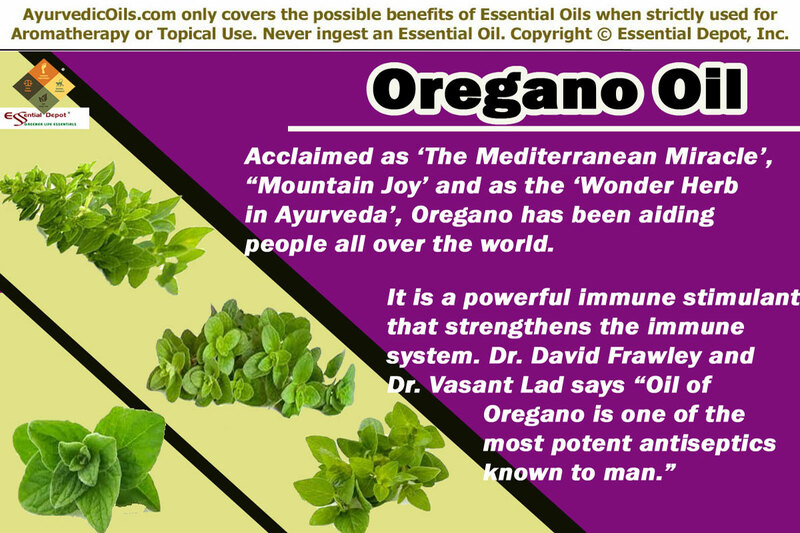 Acclaimed as ‘The Mediterranean Miracle’, ‘Mountain Joy’ and as the ‘Wonder Herb in Ayurveda’, Oregano has been aiding people all over the world and especially in the Mediterranean regions to maintain healthy living for numerous centuries. Botanically known as Origanum Vulgare, Oregano is yet another prestigious limb of the mint family, Lamiaceae and has its origin in the Mediterranean region and southwestern Eurasia. Ayurveda, the mother of all healing sciences used Oregano (known as Sathra) and its essential oil as a heating carminative to treat digestive disorders and was also used for treating toothache, skin problems, pain and inflammation. Known as the staple herb of the Italian-American cuisine, Oregano is one among the best culinary herbs in the world used in a variety of Mediterranean cuisines, Mexican food, Italian dishes and is also used in making fried, roasted or grilled vegetables, meat, fish and much more food varieties. It is also a part of many Lebanese, Turkish, Palestinian, Spanish, Greek, Portuguese, Syrian, Latin American and Egyptian cuisines. Oregano essential oil is extracted from the leaves of this plant. This oil has been in use since the primordial times in various medicinal practices. The Traditional Chinese Medicine used Oregano for treating vomiting, fever and diarrhea. The fresh leaves were used in tea for strengthening the immune system and for dealing with infections. Biblical texts denote Oregano as a cleansing tonic. The ancient Arabic medicine used this herb for food preservation and for treating gastrointestinal disorders. The natural medicinal system of Philippines used Oregano and its essential oil for treating cough and ear aches in children. It was also used in curing pain and given for women after childbirth for its emmenagogue properties. Hippocrates, the ancient Greek physician and the father of western medicine used Oregano as an effective antiseptic and for treating respiratory and digestive ailments. History denotes that it was the Greeks who discovered the disinfectant and antimicrobial properties of this oil and they used it for treating skin infections, sore throat, wounds, viral infections and for protecting the body from the effect of harmful organisms. Oregano essential oil is enriched with chemical constituents like carvacrol, cymene, thymol, borneol, terpinene, pinene, linalyl acetate, bisabolene, linalool, caryophyllene and geranyl acetate. The remedial properties of this oil are antimicrobial, antiseptic, anti-viral, anti-bacterial, anti-parasitic, antioxidant, emmenagogue, anti-allergenic, digestive, anti-inflammatory and immune stimulant. Ayurveda means ‘science of life’, the science that preaches the simple methodologies to prevent illness, stay healthy and for healthy aging that makes you independent in your 60s or 70s without relying upon anyone to assist your health conditions. The philosophy of Ayurveda relates the life of an individual with the life of the Universe. Based upon this innate wisdom, Ayurveda further explains that the Universe is made up of five elements namely fire, water, earth, air and ether and it also states that an individual is also made up of the five elements of nature, which is also known as the building blocks of life. Among these five elements water governs the movement of fluids in the body like blood, saliva, mucus and plasma. Fire determines the digestive power, intellectual skills and body temperature. Air controls the functioning of the heart, stomach, lungs, joints and intestines. Ether is present in all parts of the human body where the presence of cavity and emptiness are witnessed like heart, nostrils, blood vessels, bladder etc. Earth represents vigor, braveness, constancy and steadiness. The individual constitution comprises of three energy elements known as doshas (vata, pitta and kapha). Vata represents air and ether, pitta stands for fire and water and kapha stands for water and earth. Imbalance of doshas leads to illnesses. Ayurveda recommends the use of herbs, essential oils, healthy lifestyle, meditation and yoga to bring the body and mind back to balance. Oregano oil is known to enhance pitta deficiency and reduce kapha and vata excess. Oregano oil has been proved effective for treating numerous infections and allergic conditions with its antibiotic, antimicrobial, anti-viral, anti-bacterial and anti-parasitic properties. The Georgetown University research on Oregano oil’s effectiveness against drug-resistant bacteria, proves that the presence of carvacrol component in Oregano oil lessen the infections as effectively as the traditional antibiotics. A study conducted by the Mexican researchers on the effectiveness of Oregano to treat giardia, which is a water-borne bacterium that lives inside the intestines. Another study proves that Oregano oil is effective in killing giardia bacterium than the generally prescribed drug tinidazol. Oregano is a powerful anti-bacterial oil that wards off numerous pathogenic bacteria like E.coli, Staphylococcus aureus and Strep and protects one from typhoid, sores, cholera, infections in the colon, urinary tract and certain other skin infections. Parasites like tape worms, round worms, mosquitoes, fleas, lice and bed bugs cause innumerable communicable diseases that affect the human body severely. Oregano essential oil has anti-parasitic properties that aids in killing parasites. Viral infections like cold, pox, mumps and measles weaken your immune power and paves way for other harmful organisms to affect your health. Oregano essential oil is a powerful immune stimulant that strengthens your immune system, fight against viruses and makes your system resistant to other foreign bodies. Fungal infections like athlete’s foot and ringworm can be treated aromatically with the antifungal properties of this oil. Being an anti-allergenic oil, Oregano acts as a sedative and pacifies the hyper-sensitive reaction responsible for allergies. A 2001 research on ‘Antimicrobial activity of essential oils from plants against selected pathogenic and saprophytic microorganisms’ proved that among the 11 essential oils tested for effectiveness against microbes, Oregano essential oil showed the highest inhibitory rate against pathogenic and spoilage microorganisms. The carvacrol and thymol compounds in this oil are very effective in killing a microbe known as Candida, which is the reason behind eczema and psoriasis. To guard yourself against such infections and allergies, you can either topically apply 2 drops of Oregano oil blended with olive oil on the affected area or add 2 drops of oil in your bath or skin care cream or lotions. Oregano essential oil is a heating carminative oil that aids in increasing the pitta flow and promotes quicker digestion. Massaging your tummy with 2 drops of Oregano oil blended with sesame oil can assist in treating slow digestion due to excess of mucous deposits in the stomach or fullness. You can also add 2 to 3 drops of Oregano oil in warm compresses to help with stomach upsets, relieving gas, enabling the movement of food and for regularizing the entire process of digestion. As Oregano essential oil has warming effect, it can assist the body when it is cold and treat problems like cold, sinusitis, headache, mucous congestion, whooping cough, pneumonia and other respiratory infections. Oregano essential oil is said to be one of the best essential oils for opening blocked sinus passages and treat congestion as a natural decongestant. Light Miller in her book ‘Ayurveda and Aromatherapy’ says that Oregano essential oil is a warming diaphoretic oil that eliminates surface toxins, provoke perspiration, improve blood circulation and relieve headaches due to congestion or cold. Add 2 drops of Oregano oil to steaming water and inhaling this medicated steam will aid in alleviating congestion, open blocked nasal passages and relieve pain due to cold and infection. You can also blend 2 drops of Oregano oil with coconut oil and gently massage the soles of your feet or apply on your chest and back or add it to warm bathing water for immediate relief from cold, sore throat and sinus problems. The anti-inflammatory, immune stimulant and warming diaphoretic properties of Oregano oil assist in eliminating toxins from the body, reduce inflammation, increase blood circulation and lessen pain and inflammation in rheumatic and arthritic patients. Gently massaging the affected area with 2 drops of Oregano oil blended with coconut oil or adding it to your bath helps in reducing pain and inflammation in arthritis. Oregano essential oil has been proved by the Physiotherapy research to contain morphine-like properties that act as a perfect pain relief aid. The University of Arizona research and the study by the Long Island University have proved that Oregano essential oil has antioxidant and anti-cancerous properties that fights against many types of human cancers. Prostate cancer has been listed as the second important cause of cancerous death in American men. This study found that the presence of the active constituent, carvacrol in Oregano oil helps in the treatment of prostate cancer by stimulating apoptosis (programmed death of cells) in prostate cancer cells. Oregano essential oil also helps in alleviating dysmennorhea, normalizing blocked menstruation and treating menopausal symptoms. This oil is also used for treating intestinal parasites, muscular pain, warts, vaginal candida and asthma. Never use essential oils directly on the skin and always dilute it in suitable carrier oils as essential oils are highly concentrated solutions. Avoid using essential oils internally. Consult your Ayurvedic physician before using the right essential oils for your unique individual constitution and state of health. Avoid using essential oils if you are pregnant or a nursing mother. 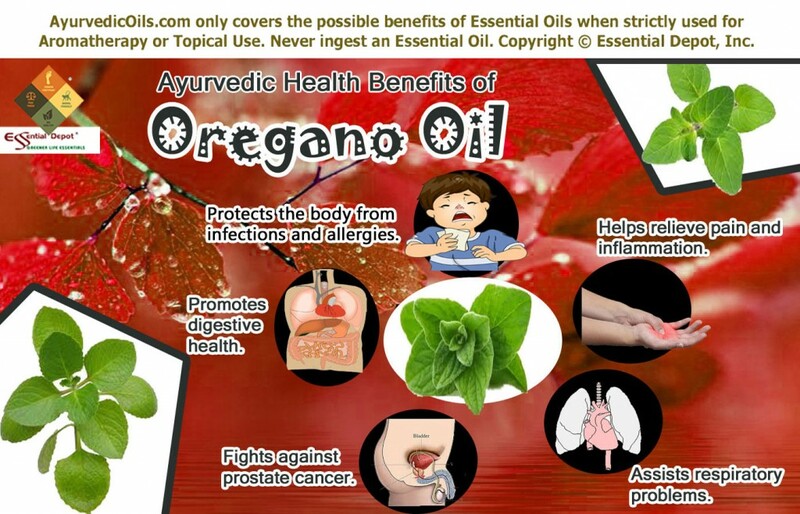 This entry was posted in Ayurvedic Essential Oils, Essential Oils - Learn About and Purchase, Uses of Ayurvedic Essential Oils and tagged Antibacterial oils, Ayurveda and Oregano, Ayurvedic health benefits of Oregano oil, Ayurvedic oils for cancer, Ayurvedic oils for cold, ayurvedic oils for digestion, Ayurvedic oils for digestive problems, Ayurvedic oils for inflammation, Ayurvedic oils for menstrual pain, Ayurvedic oils for pain, Ayurvedic oils for sinus, Ayurvedic oils for sore throat, Ayurvedic oils for viral infections, Ayurvedic remedies for prostate cancer, candida, carvacrol, Chemical constituents of Oregano oil, culinary herbs, Health benefits of Oregano essential oil, Oils for arthritis, Oils for rheumatism, Oregano oil, Origanum Vulgare, Therapeutic properties of Oregano oil, thymol by AyurvedicOils. Bookmark the permalink.